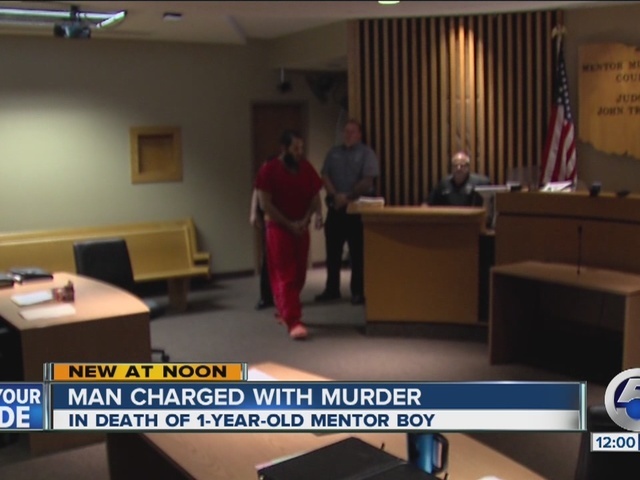 A man charged with murder in the death of a 1-year-old Mentor baby had his bond set at $1 million on Monday. Anthony Francisco Garcea, 23, did not enter a plea on Monday in the death of 1-year-old Khalil Abbasi. Police were called Thursday evening to the Park House Apartments on Mentor Avenue for a report of an unresponsive 1-year-old boy. When officers arrived, the caretaker—identified as Garcea—said the boy had fallen and hit his head. Khalil was taken to Hillcrest Hospital with head trauma and then taken to Rainbow Babies and Children's Hospital. The boy died in surgery. Preliminary results from the Cuyahoga County Medical Examiner showed that the injuries were not consistent with what Garcea said happened. On Friday, Garcea was arrested and charged with murder in the baby's death. Police say he is the live-in boyfriend of the child's mother. According to officials, the investigation revealed that Garcea forcibly struck the boy in his head, causing the fatal injuries.